Need an accurate pool chemistry Dosing Calculator? Yes, there's an App for that. Pool operators and service professionals have a tough job to do. Pool owners expect their service experts to know exactly what to do, and when to do it. We created the Orenda App dosing calculator to help ease that burden. Our dosing calculator features a real-time LSI reading. Pool operators should use the LSI (Langelier Saturation Index) as the objective standard of water saturation, and base their chemical dosing strategy around it. Sanitation levels are a different calculation that does not affect the LSI. Therefore, we suggest balancing the LSI first, and adjusting sanitation levels independently of it. Adjust pool chemistry to get the water LSI value to neutral, and adjust sanitizer levels from there. Our app has two separate LSI values: one for the current readings, and one for the desired (future) readings. When you open the app, it will ask you to pick your language. You can change this later in the menu>settings. We offer this app in English and Spanish. On the dosing calculator page, you will notice at the top left a slider to select "residential" or "commercial" water. This does not impact the LSI, but will have an effect on the chemical dosing results. Input the gallons of the pool at the top right where it says "Enter Quantity". On the left side under "Current Levels", input the current water readings and temperature by sliding the dials left or right. Input the numbers exactly as they are when you test them. The left side should be the truth, and nothing but the truth. Yes, even if the truth is ugly. Notice the LSI reading at the bottom of the left side will change as you adjust the dials. Your water is in the safe LSI range if the number is green. Zero (0) LSI is perfectly balanced water. If it is red, your water is out of range. The water is under-saturated and corrosive when negative; and when positive, the water is over-saturated and scale-forming. On the right side, adjust the dials to where you want the water to be, being mindful of the LSI reading at the bottom. Make these numbers practical, based on your current readings (on the left). For example, you wouldn't want to make a huge change in any one category just to get a good LSI value. It needs to be attainable water chemistry. Once you have your desired chemistry inputted, click the "Get Dosage" button at the bottom. Share your results via email with a date and time stamp. These results show you exactly what it takes to get from the left side (current) of the calculator to the right (desired). For chlorine, there are two options listed, separated by "OR". Do not add both types of chlorine to the pool! Just use the type of chlorine you currently use. Results are in ounces and pounds. For larger quantities, use an external calculator to convert ounces to gallons or pounds. Remember, 16oz = 1 pound, and 128 fl.oz. = 1 gallon. Below the first segment of results you will see a blue bar titled "CV-600/CV-700 Enzyme". Everything below this bar is dosing information for Orenda products, as labeled. You can ignore them if you don't use Orenda products; it's okay, we won't judge you. If you do use Orenda products, most of them show a "Purge" and a "Weekly Maintenance" value. Always apply the Purge dose if it's the first time that pool has had Orenda treatments. It is a once-per-year initial dose. For example, SC-1000's purge dose is the same as the startup dose, as it is most commonly used during initial startup. At the top right, tap the envelope icon. It opens an email with a date and time stamp. You can email the results to whomever you want, and keep track of your chemistry history for that pool. 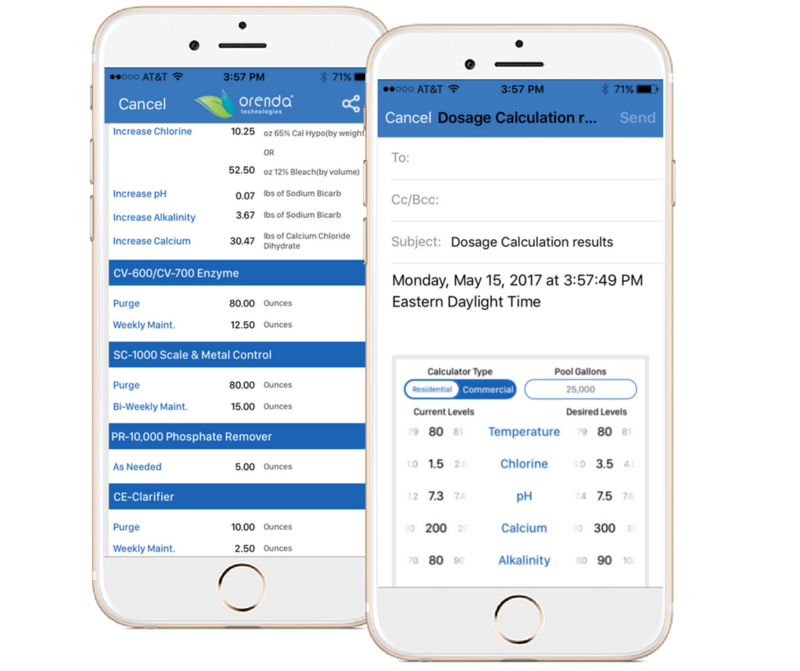 Besides the dosing calculator, the Orenda App features videos, our blog, and product descriptions, complete with MSDS sheets. These pages can be found in the menu by tapping the icon at the top left of the screen. Explore the app and please leave us a review in the App Store or GooglePlay!